The greenback staged an impressive recovery on Monday back from 96.36 reaching a high of 97.22 that led Gold to finish in the red. This was mainly due to Brexit-related news that helped the Dollar gain traction thus putting pressure on the yellow metal. However, gold could gain momentum again as the market continues to discount the Fed's tightening policy and the deterioration sentiment with regards to the US growth that could continue to weigh on the Dollar. As expected, Gold went for a little recovery during yesterday's session to retest the $1241.76 support level after printing new highs. 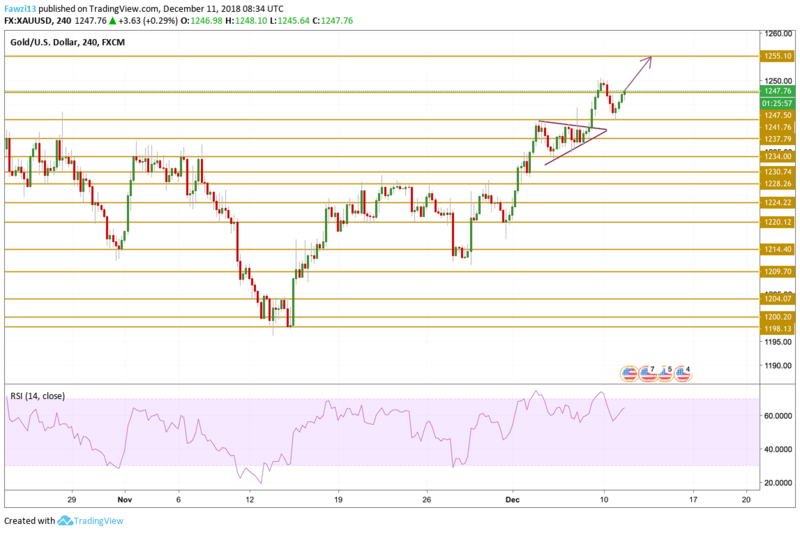 After founding support, prices are back up near highs as they are hovering above the $1247.5 level with a bullish momentum that recovered from overbought conditions. We expect the upward move to continue with our focus on the $1255.1 resistance level.